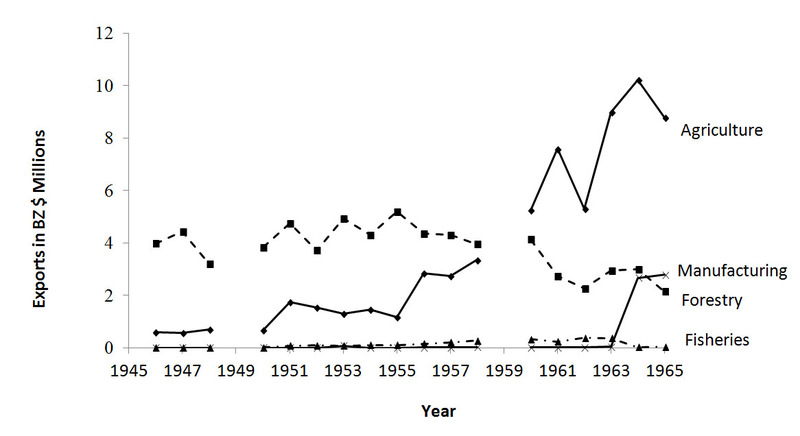 The 1950s: decline of forestry and the rise of agriculture in Belize. Home » Blog » Uncategorized » The 1950s: decline of forestry and the rise of agriculture in Belize. The Forest Trust was conceptualized to improve the management of the mahogany, cedar and sapodilla resources of the country. The low supply of logs dovetailed with the low demand for mahogany caused by the economic depression of the late 1920s so exports were subdued between 1921 and 1936. To compensate for low production from Belize’s forests, the British made arrangements with the American government to extract wood from Peten in 1944. The following year, a law which prohibited felling of logs without a permit from the Conservator of Forests was passed in Belize. After WWII, the mahogany and chicle industries were said to be in recession although the U.S.A. was purchasing over a million cubic feet of Belize’s mahogany. On the other hand, the U.K. was importing less than 1% of the production as the world emerged from WWII. 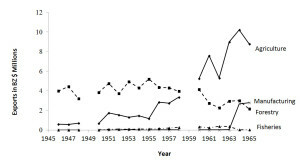 In the late 1950s, export crops like sugarcane and citrus industries took off (Figure 22) and efforts to grow more of the staples such as rice and corn also resulted in the establishment of more agricultural businesses. Private enterprise began to see that business in Belize could not survive on the exportation of timber alone and companies such as Maestre’s Industries began investing in the manufacturing of furniture and boats for export. Companies also became engaged in the production of aluminum manufactures. One company in Corozal pioneered the exportation of mangrove tannin extract into Mexico. In the early 1960s, manufacturing of garments was started by Williamson Industries, and the Hercules of Mango Creek began producing rosin from pine trees. The new efforts in agriculture and light manufacturing were fuelled by local investors as well as Americans; Britain was not profiting from Belize’s resources as it once did. This caused the colonial government to slash the budget of the Forestry Department. In his 1959 report, the British economist Jack Downie argued that, “it will be after 1990 before the income earned from forest development begins to exceed the cost”. As a result, a decision was taken that caused the investments in silvicultural improvements, plantations, infrastructure and forestry roads to be considerably scaled back after 1959. The forestry exports did not collapse but there were no increases after this date. On the other hand, agricultural crops such as sugarcane and citrus became more important to Belize as the Libertad sugar factory and Citrus Company of British Honduras factory began working at capacity in the early 1960s. Read more in our book, A History of Enterprise in Belize. ← Ever heard of the Forest Trust of 1922?